QUT biofabrication team has made a major breakthrough by 3D printing mechanically reinforced, tissue engineered constructs for the regeneration of body parts. In an article published in Nature Communications, the biomedical engineers outlined how they had reinforced soft hydrogels via a 3D printed scaffold. Professor Dietmar W. Hutmacher, from QUT's Institute of Health and Biomedical Innovation, said nature often used fibre reinforcement to turn weak structures into outstanding mechanically robust ones. "Such is the case with articular cartilage tissue, which is formed by stiff and strong collagen fibres intertwined within a very weak gel matrix of proteoglycans," Professor Hutmacher said. Professor Hutmacher said hydrogels were favoured because they had excellent biological properties, however, the hydrogels currently available for tissue regeneration of the musculoskeletal system couldn't meet the mechanical and biological requirements for successful outcomes. "Our international biofabrication research team has found a way to reinforce these soft hydrogels via a 3D printed scaffold structure so that their stiffness and elasticity are close to that of cartilage tissues." Professor Hutmacher said the team had introduced organised, high-porosity microfiber networks that are printed using a new technique called "melt electrospinning writing". "We found that the stiffness of the gel/scaffold composites increased synergistically up to 54 times, compared with hydrogels or microfiber scaffolds alone," he said. "Computational modelling has shown that we can use these 3D-printed microfibres in different hydrogels and a large range of tissue engineering applications." A link to the Nature Communications article, Reinforcement of hydrogels using three-dimensionally printed microfibres, is here. 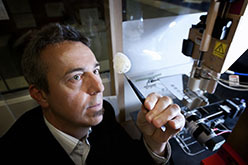 Professor Hutmacher leads the team of biofabrication at QUT, one of three of the world's leading research universities in the 3D printing of replacement body parts that together offer the world's first international masters in biofabrication whereby graduates earn a masters degree from an Australian university in addition to a masters degree from a European university. For further information on the Masters of Biofabrication, contact Biofab-masters@qut.edu.au.